Only Four Weeks to Essen! Have I mentioned I’m getting a little excited? Didn’t think so. Anyway, I am. With Mr Sinden’s prompting I have up for auction various games that I’ll be taking with me to Essen. There’s fifteen of them. So far I have three sold and bids on another eight. I’ve made just under 250€ so far, that’s more new games I really don’t need, have little space for, and will possibly never play. And yet I’m excited, ridiculously so. Breathe, calm down, relax. There was quite a store of games on offer and several had some runs out. Whilst the waited for the additional forces to muster, the first five along for the evening started off by passing the Thugs, Holdings and Action cards around the table with a 'quick' game of Greed. 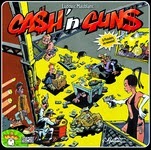 Gareth II and Neil played actions to stop other players getting too much money, whilst playing lotsa Thugs too. Jeroen and Dan were trying a mixed bag with differing results. Paul was going for out and out holdings. Paul playing a holding that gave him an additional $5k / dollar token on it at the end of the game, which is where he started to predictably load up his dollar tokens. Dan playing the ritz with some schmancy add ons which allowed him to place eight dollar tokens on it in one go - £80,000, very nice. On the last turn Paul then played an action that allowed him to place as many tokens on one holding as the holding from his opponents that had the most holding. He of course used this to better Dan's impressive eight tokens, by placing eight on the card that made each one worth £15,000 with the resulting £120,000 giving him a runaway victory. All in the last card. He remembered to say thank you to Dan. After quite a few plays of this game, it is still providing plenty of variety with different strategies able to complete for victory. Final Scores; Paul - 240, Dan II - 120, Neil - 95, Gareth - 80, Jeroen - 40. Whilst that was going on I’m sure I espied Tom and Philip playing Splendor. No idea who won though. A quick opener for 6 players was required whilst the Greed table finished off, so Jon's recent Games Expo acquisition was broken out. A quick rules explanation from James and the shooting began. The general summary of a fast and chaotic game was that Tom and Noel stood toe to toe most of the time, Jon ducked out of some early exchanges, Phil chose the wrong moments to be brave and Andy pretty much flew under the radar. James was playing the macho role, taking a couple of hits but still choosing to stand his ground when he pointed his gun at Jon, only to find a black foam beretta staring straight back at him. Was Jon bluffing? Definitely not - in fact he had played his fire-first 'Bang Bang Bang' card, and left James in a crumpled, convulsing heap on the floor - out of the game for good. If only you could do that in more games…. Anyway, Andy's quiet, ruthless tactics paid off, and he sneaked out a win with $90k. Everyone else had less than that, but exactly how much remains a mystery…. 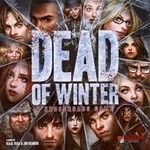 Following that a bunch of hopefuls ran off into the Dead of Winter and I know they failed in whatever it was they were attempting to do. The details remain in the inner sanctum. 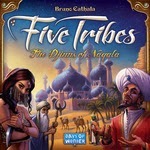 Meanwhile Five Tribes, the latest Days of Wonder offering made its debut, but once again I have no idea what occurred, and I would be interested as it’s quite ‘hot’ in the games world at present…. Four willing participants were found to have another go at this 'Dominion with a board' game - and this time it was with Jon's new map (Germany / US). The German side of the map was used, and it has an interesting array of cities and connection spaces (instant 3 or 4 points). Jon chose to set up next to the connections to SW Europe, Paul and Neil took opposite corners, and Noel sat on Jon's lap. There were no cards in play which enabled Waste to be trashed, but the ever popular Tourist Train (score points as the game goes on) was available, along with the equally popular Garage (draw 2 cards, discard 2 cards). It was interesting that a variety of strategies were employed. Jon (unusually) chose to start playing on the board, building into the adjacent connection spaces before Noel could get there. Neil also made his intentions clear, starting to build track and stations across the Eastern edge, accumulating an impressive array of waste as he went. Paul took a more mixed approach, starting to build out slowly into some nearby cities, but also attempting to build his deck with some useful cards, including a few Tourist Trains. Noel was very single-minded, building almost nothing on the board for the first 3/4 of the game, but picking up a healthy amount of Tourist Trains, along with some high money cards and several card-cycling cards. This led him to soon have a fine engine that was cycling cards at a frightening rate. Jon and Paul had also picked up Tourist Trains, but Noel was clearly ahead on points in this department, and was the first to start purchasing the Skyscrapers. Paul had been maxing out the stations in some cities, but also started to purchase some points cards towards the end of the game. Jon tried to pick up some points cards, but always seemed to fall one money short of the skyscraper and had to settle for the less valuable points cards. Neil continued on his single-minded train route and would not be distracted (or more likely, didn't have the money!) to buy any points cards. Noel suddenly turned his attention to the board, and had enough wealth to enter the connection spaces that Jon already occupied, picking up a useful 9 points with relative ease. Paul found that he could end the game on his turn, with 4 piles of cards running out, and the scores were totalled. It was pretty obvious that Neil and Jon were out of the running, but a quick look at the board position showed that Paul might be closer to Noel than originally expected. And so it turned out to be - a few measly points separated them at the end, with Noel's carefully planned 'don't play to the board until the last few turns' strategy just paying off. Well played sir! The upcoming ('Rising Sun') expansion looks interesting, not only for the 2-player boards, but also for the 'route bonuses', that will certainly make Neil's strategy much more viable. Watch this space…. Final Scores; Noel - 60, Paul - 57, Jon - 47, Neil - 34. As always, the game is completely about timing - when do you entomb your cards to start scoring for them? Andy and Jon had started collecting sets from the get-go, and both played some attack cards to reduce other player's hands on a couple of occasions. Final Scores; Jon - 30, Andy - 22, Phil - 13, Dom - 12. With a fine selection of games on offer it was decided Kingdom Builder was next up for Neil, Paul and Noel. Neil actually professed his excitement level to be a resounding 7/10 so with that exhilarating endorsement Kingdom Builder was set up with scoring to be horizontal lines, individual settlement areas and adjacency to location hexes. The special tokens allowed to place extra on sand, add one to 3-in-a-row, and move one to water and to your current terrain card. Short story made shorter, Noel had lots of tokens and points, Neil and Paul not so many but the cashews were nice. With plenty of time still in hand it was over to one Paul and I knew Noel wasn’t so keen on. It was the only way we were going to stop him. 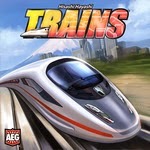 James jumped in, I know this is on his Essen ‘pick-up-cheap’ list. I let him go first. Paul put up a fine performance of running through the rules I just reminded him of although we did catch both Noel and James with 11 tokens on occasion. I’ve been sticking to a strategy of working towards cards in the second row that score points and not worrying so much about collecting sets for the bonus noble tiles. Final Scores; Neil - 16, Noel - 14, James - 11ish, Paul - 8ish. 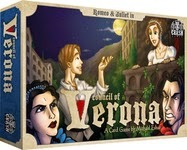 After that I saw some Council of Verona being played, I love that game! Not a clue who did what to whom and why or even whether anyone survived. What a mysterious evening! Everyone’s played this, except me of course… dexterity game see, not really built for dexterity although at least I didn’t have to try and unwedge myself from the chair, more a case of taping the plastic thingy in time. Reminds me of the time I joined a reggae band. They let me play the triangle, which was nice. I just had to stand at the back and ting. Anyway, first game, Paul, handily to my left, took himself out pretty swiftly. I just kept on tingin’. Then Dom, or was it Dan (I was concentrating so hard I it failed to register) blew himself away so Tom too over whilst I kept on tingin’. James, the most experienced looper in the business was looking good until he lost two tokens in succession and the impossible looked on until Tom, substitute Tom, knocked me off my perch. I almost won a dexterity game, I mean, come on! So we play it again. Almost identical game plays out. Except of course, I win. How many dexterity games has it taken for me to win one? In fact I won one the week before at Paul’s house, Tumblin’ Dice. Maybe I am built for these things after all? So, did we impress the pub with our efforts? Well photos were being taken, our audience reached it’s capacity attendance for maybe a half hour spread across the course of the evening: one! Of course we did, although the chef was pleased to hear that Gareth’s on shift next week, he was exhausted.